Faith Muigai’s professional background stems over 20 years of local and international health experience in both public and private sectors. She currently serves as Regional Director for the SafeCare program for the PharmAccess Foundation. 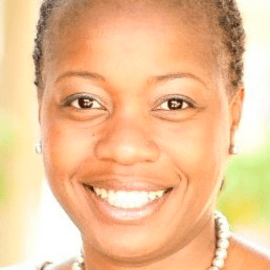 Previously she served as Chief Medical Officer for Jacaranda Health, a scaling organization, whose mission is to provide high quality, affordable Maternal and Child Health services in Kenya. Her leadership contributed to achieving SafeCare Level 5-the first health facility in East Africa and third in Africa to attain this level of certification amplifying quality of care through the PharmAccess Foundation. Previous roles have included frontline health service delivery, clinical research, program development and executive management in leading health institutions (Johns Hopkins Hospital and University Specialty Hospital, an affiliate of the University of Maryland Medical Systems and LifeBridge Health). Faith has designed and implemented local and regional healthcare projects, participated in local and national health collaboratives that positively impact healthcare services. Mrs. Muigai is an elected Board Director for the Kenya Healthcare Federation, nominated Board Member for Nairobi County’s Pumwani Hospital and serves on the Kenya Nursing Council’s Discipline, Standards and Ethics committee.